Papon Apartment is a spacious 2-bedroomed apartment in a typical Nicoise house. It is central and convenient, is perfect for a family or group of friends and comes highly recommended. The apartment occupies the whole of the 2nd floor, thus allowing for ultimate privacy, and is only 60-100 metres from the Old Town. With two bedrooms and 1 bathroom, this apartment can sleep up to 6 people. 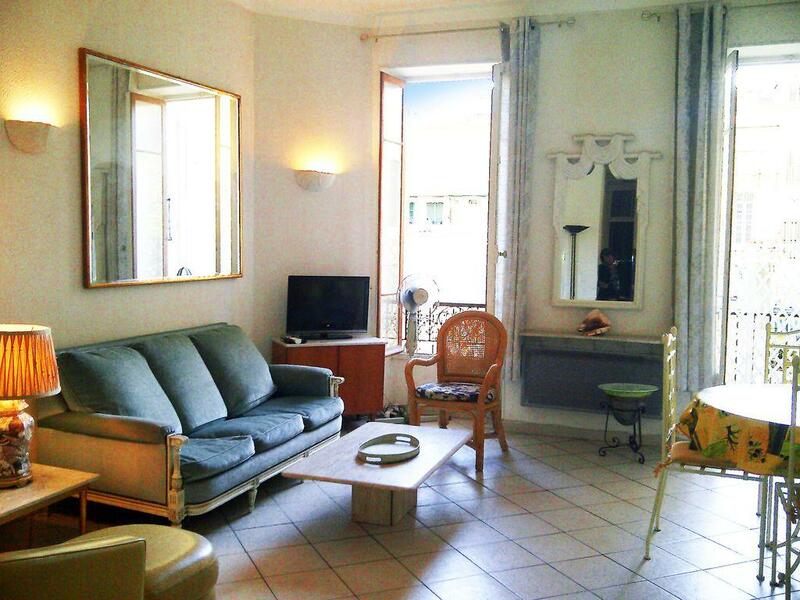 Papon Apartment is an attractive two bedroomed apartment located in a lovely area of Nice. With 2 bedrooms, this apartment can accommodate up to 6 people and is very conveniently located only 60-100 metres from the Old Town. This apartment is a traditional Nicoise house which was built in 1900 with a typically Nicoise entrance hall and staircase, in a very central position. There is an entry-phone system and the apartment has marble-tiled floors throughout. The large sun-filled, south-facing living room has two sofas - one of which converts into a proper mattress bed to sleep a further two people if required – thus giving a total sleeping capacity of six in three separate rooms if needed. There are wonderful French doors opening to a small south-facing balcony – which is ideal for taking your coffee in the morning sunshine, or a little later in the day, a glass of wine. Other features include the original marble fireplace, a large glass-topped dining table and dining chairs, a newly fitted kitchen with a four-ring electric hob, a microwave/grill, a fridge/freezer, an electric kettle, a toaster and "cafetière", a washing machine/dryer and an ironing board with iron. There is WiFi available throughout, a CD/tape player/radio, a DVD player should you wish to bring your favourite movies and music for the television, if you find time to watch it of course! The first bedroom has two pairs of long windows as well as the original marble fireplace, making it a wonderful place to relax. There is a large double bed which is twin-linked with separate mattresses and bases, and can therefore be separated to make 2 single beds if you prefer. The second bedroom has a sofabed with proper mattresses, which, unusally, is designed to give a single bed, or two separate single beds, or you can place the two singles side by side to create a full sized double bed. There is a large wardrove and a further large cupboard in the entrance hall - plenty of storage space! There is a separate WC with full-sized windows, as well as a spacious shower room with a large hand basin - this room also has full-sized windows. A hairdryer is provided, no need to waste valuable suitacase space! Both the WC and the bathroom can be accessed at all times of the day or night, without disturbing each other. There are electric heating radiators in every room, should you ever need them. What makes this property special is that it is spacious, bright and sunny with two bedrooms. The high ceilings occupy the entirety of the second floor of the building (accessed by stairs), so there are no other apartment on your level, thus giving you additional privacy. Because the apartment is what the French call "traversant" (running from the front of the building to the back), you have light from the South and the North, and "through-air" - very important on hot days and nights. The windows and balcony doors have the traditional and much-loved wooden louvred shutters, perfect for keeping the apartment cooler on very hot days. By taxi, bus, hire car or private car, the property is conveniently only ten minutes from Nice Airport. The apartment is ideally placed for you to enjoy Nice and all of the Côte d’Azur. The Nice tramway passes within 30 metres of the apartment. If you want to go off and explore the rest of the French Riviera, the central bus station is only 150 metres away. A car is definitely not necessary - although if you arrive by car or hire a car whilst you are here, there are parking meters in the street and there is a multi-storey car park within 150 metres. The outside area of the property consists of a balcony with chairs in order to enjoy the view, with a glass of local wine in hand. - Two sofas, one of which converts into a proper mattress bed to sleep a further 2 people if required. French doors opening to a small balcony. Fireplace, large dining table and chairs. - 4-ring electric hob, microwave/grill, fridge/freezer, electric kettle, toaster, "cafetiere", a washing machine/dryer, iron and ironing board. - WIFI available, a CD/tape player/radio, a DVD player and a television. - The large double bed is twin-linked with separate mattresses and bases and can, therefore, be separated to make 2 singles if you prefer. - This room has a sofabed, with proper mattresses, designed to give a single bed, or two separate single beds, or you can place the two singles side by side to create a full sized double bed. There is a large wardrobe and a further large cupboard in the entrance hall. - Shower, large wash hand basin. Hair dryer is provided. This Nice apartment is extremely well situated being only 30 metres from the delightful 18th century Place Garibaldi and the new state-of-the-art tramway, 100 metres from the corner of the Old Town (Vieux Nice), 150 metres from the Gare Routiere (Central Bus Station). It is within a few minutes walk from the Marina (Port), beaches, the Chateau Hill and park, museums, galleries and concert halls, the Acropolis conference centre, the beautiful Place Massena with its impressive fountains, the famous Promenade des Anglais, hundreds of charming restaurants, brasseries, bistros, bars and pavement cafes, and every type of shopping you could wish for. There is a big supermarket within 50 metres. The Nice tramway passes within 30 metres. If you want to go off and explore the rest of the French Riviera the central bus station is only 150 metres away. A car is definitely not necessary - although if you arrive by car or hire a car whilst you are here, there are parking meters in the street and there is a multi-storey car park within 150 metres. There is WIFI available, a CD/tape player/radio, a DVD should you wish to bring your favourite CDs and DVD films and a television, if you find time to watch it! This was our fourth holiday in this apartment which is very comfortable - the location is excellent, so convenient for all amenities/good restaurants/local (cheap)! transport by bus (short walk) or tram to the rail station. We have always found the owner to be very helpful and accommodating.